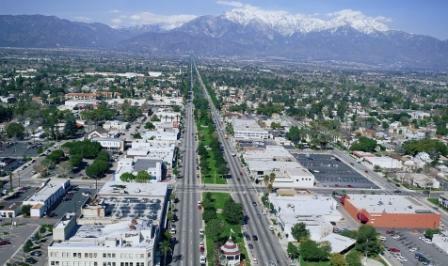 Euclid Avenue from Historic Downtown looking north to San Gabriel Mountains. The Policy Plan states long-term goals, principles and policies for achieving Ontario’s Vision. It guides growth and development to achieve optimum results from the City’s physical, economic, environmental and human resources. The Policy Plan serves as the City’s General Plan which is mandated by state law. General Plans are required to include seven elements (Land Use, Housing, Circulation, Noise, Safety, Open Space and Conservation). The organization of these seven elements, and any optional elements, are determined by the local jurisdiction. The General Plan is required to be comprehensive in nature and internally consistent. Ontario’s General Plan is made up of nine elements: Land Use, Housing, Mobility, Safety (including Noise), Environmental Resources (including Conservation), Parks and Recreation (including Open Space), Community Economics, Community Design, and Social Resources. State law requires that local jurisdictions update their General Plans every 10 years and their Housing Elements generally every five years. Ontario’s last comprehensive General Plan update was in 1992. The Housing Element was updated in 2001. In addition to being a comprehensive update to the City’s General Plan, The Policy Plan incorporates the goals and policies necessary for the City to achieve its full Vision beyond what state law mandates. The Policy Plan is intended to be a long term policy document. It includes abiding principles for each element, goals (what we want to achieve) and policies (how we accomplish these goals). Except those that are required by Housing Element regulations, implementation measures are not a part of The Policy Plan. However, given the web format, links to implementation measures are included in each element section. Takes a fresh look at the changing circumstances within the City and the region since the previous General Plan was adopted. Establishes a strong, yet flexible policy base that moves the City towards its Vision. Incorporates the current City Council Priorities (goals and objectives) into this policy document which will help guide future Council efforts when the plan is updated or revised. Complies with State requirements for local general plans. Imbeds the City’s governance approach into how it operates and makes decisions.